Gooseberry is very tasty and useful berry. Eat it fresh, making summer soups, compotes, jelly and filling for pies. To bright green fruit pleasing to you and in the winter, cook from gooseberry jam. Greenish-pink liquid with drowned in her strong berries will be an excellent complement to a nice Cup of tea and fresh baked goods. - 2 cups of sugar. 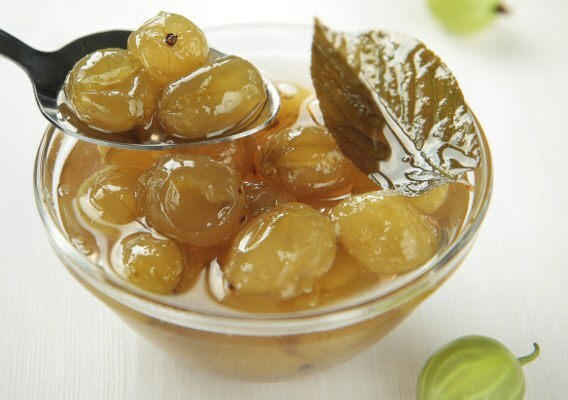 The gooseberry jam "Royal" is made from unripe, not too large berries. In this case, it becomes a beautiful view, and the fruits retain their shape. Carefully sort through the gooseberries, wash it in several waters and dry, spilling on the towel. Each of the berries cut off the tip and gently, with a hairpin, select the pulp, folding it in a separate bowl. Empty boxes lay on a flat dish, making sure it is not torn and does not wrinkle. Prepare the filling for the berries. Walnut kernels pour over boiling water and remove them with sandpaper. Finely chop the nucleus. Lemon good wash with hot water and a brush. Grind the fruit together with the peel. In the empty boxes gooseberries place the sliced lemons and nuts. The pulp out of the berries, put in a pot, add sugar. Stir the mixture and bring it to a boil. Remove the gooseberries from the heat and mash through a sieve. In a saucepan put the boxes gooseberries, stuffed with lemon-hazelnut mixture, pour the hot berry puree and leave for 3-4 hours. Remove the gooseberries from the mixture, and the berry puree back on the stove and again bring to a boil. Remove the pan from the heat again and cover berries with hot liquid. Leave the mixture for 1 hour. Then again, remove the berries and boil the syrup. Repeat the process 3 more times. Sterilize glass jars and lids. Dry banks ready to pour the hot jam into each container, place 2-3 cherry leaf and 1-2 leaves of black currant. Close the jars and place in a bowl of cold water. Leave the jam to cool, then remove for storage.